There are many water falls in the world and one of the most popular is Niagara falls located right on the border between Canada and America. Both surrounded by twin cities, Niagara Falls, Ontario and Niagara Falls New York. Declared to be a favorite and famous tourist attraction in the world and honeymoon destination. Geologist believed that the falls formed through erosion from Niagara River, exposed old marine rocks from many years ago including melted glaciers. It has three separate waterfalls the Horseshoe Falls, Bridal Veil Falls, and American falls. Six million cubic feet of water spill over the falls every minute, majority coming from Horseshoe Falls. Water falls from high up to 170 ft. In the Philippines there are also known waterfalls. One is the Tinuy-and falls, in fact it was advertised as Niagara Falls in the Philippines. 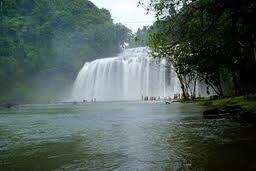 It is the main tourist attraction in the Booming city by the bay, Bislig city, Surigao Del Sur. Tinuy-an falls is one of the best waterfalls in the Philippines just like Niagara Falls the water also flows from three different levels. It is 55 meters or 180 ft high 95meters wide. Rainbow is known to appear every morning from 9:0o am to 11:00 am. Nice falls isn’t it? I’ve never been to this place although I have seen most of it on TV and ads. I am hoping to get there anytime soon. The water seems so cool and clean. I always like rainbow too ever since, it is nice to look at and soothing to the eyes…there is a feeling of relief every time i see a rainbow. I guess it would be a different feeling watching rainbow in a cool morning beside a waterfalls.